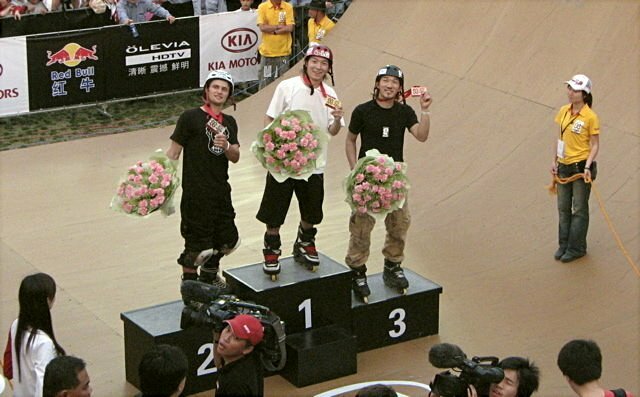 The Asian X Games took place in Shanghai China for 3 days May 2 - 5, 2007. The Speed event (Finals) is tentatively scheduled to be "live" on TV. This is good news - we just keep coming back, and this is in large part due to such great athletes as yourself attending and putting on such a great show. As the ESPN X Games moves into it's ninth year, more than 200 top action sports athletes throughout the Asia Pacific region will once again compete for prize money and medals in 5 sport categories. Categories 5: Aggressive Inline, Skateboard, Sport Climbing, BMX and MotoX. Aggressive inline skating owes a lot to skateboarding. The sport got its start in 1981 when skaters began experimenting on the same types of street and vert domains used in skateboarding; jumping on stair railings and grinding down to the bottom of the staircase. Along with growing awareness of the sport came skates designed to take the abuse of aggressive inline skating. They allowed skaters to grind on the street and vert ramps' coping with much more control. Throughout the 1990s, there were a series of inline competitions. In 1995, the first ESPN X Games in Newport, Rhode Island brought the sport mainstream, worldwide media attention. With this sudden notoriety came a boom in sponsorship for pro skaters.